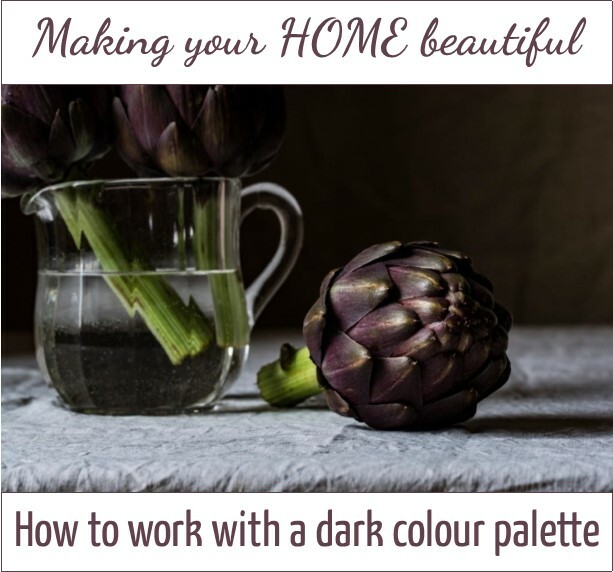 The post How to work with a dark colour palette appeared first on Making your HOME beautiful. People tend to either love or hate a dark colour palette. Those of us who do like them though are often too afraid to use them and the alternative of a light white or neutral scheme just seems an easier option. 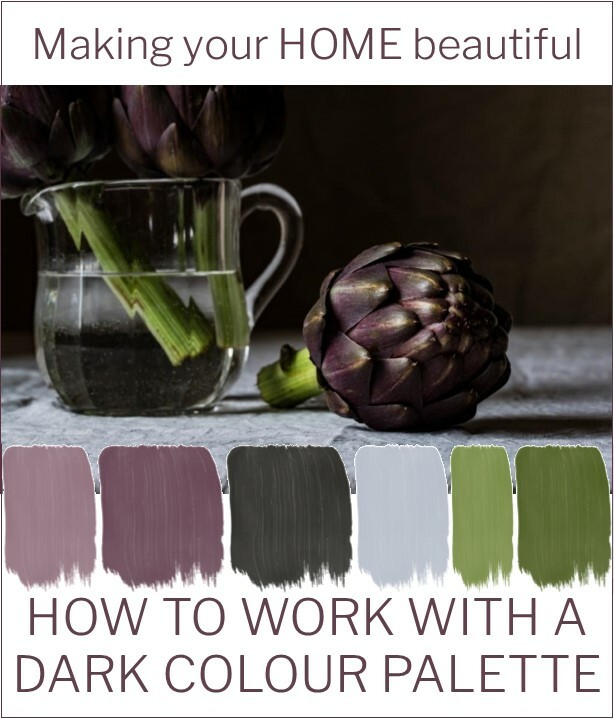 Certainly, this can be true but often it isn’t the case of selecting either a light or a dark scheme for the whole house, I believe that there are certain areas of a home that are ideally suited to an intimate and moody colour scheme whilst other areas benefit from crisp white finishes. Always consider the MOOD you want to create, the ASPECT of the space and WHEN you usually use the area. 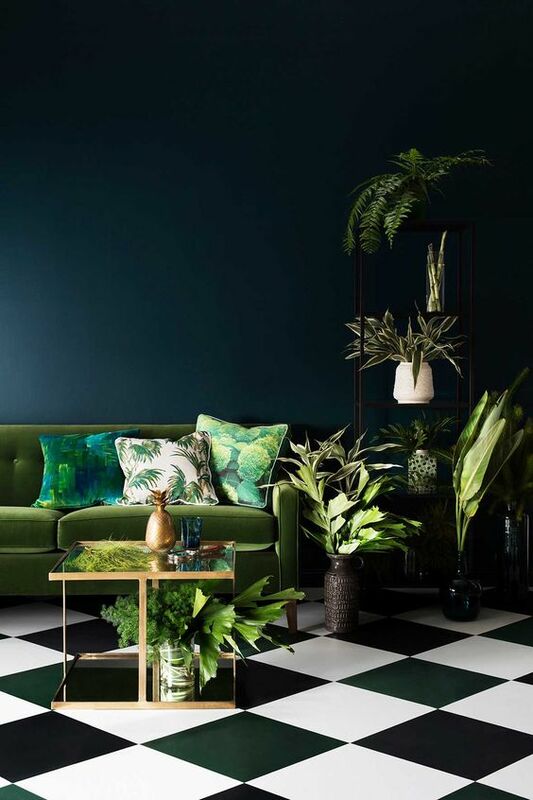 This will help you to determine whether you can get away with a dark colour palette which when used properly will inject personality and style and will be a place you will gravitate to. The UK’s Abigail Ahern really made these beautiful dark colour schemes fashionable. She embraces the dark side and her decorating schemes are instantly recognisable. Her use of layers of deep tones are inspired and she has created a certain style that has her name all over it. Her use of greenery and floral accessories in her schemes is a signature element which really brings alive this moody style. The appeal for me of a dark wall is that it provides the perfect backdrop to highlight anything placed in front of it. 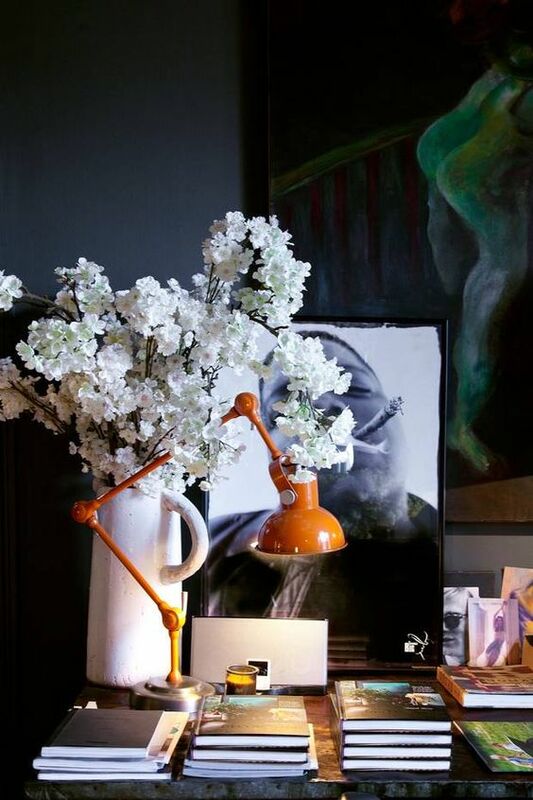 These white flowers come alive in this image and artworks are also very effective when hung on a dark wall. If you are stuck for inspiration it is a good idea to find an image that you love. It could possibly be an artwork that you already own or simply a gorgeous still life photograph. I found this one above and then extracted the colours from it and created a gorgeous dark colour palette. With the off black as the grounding neutral and the pale grey as the light relief, the addition of complementary colours in pinks and greens become the highlight of the scheme. 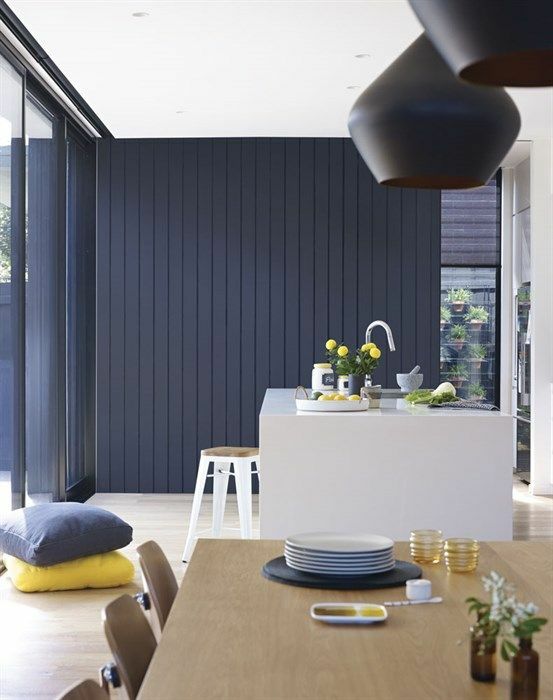 In large open plan areas dark colours can also be used to zone an area. In a classic interior, a dark kitchen looks more in place and ensures that the living area is bright and light. 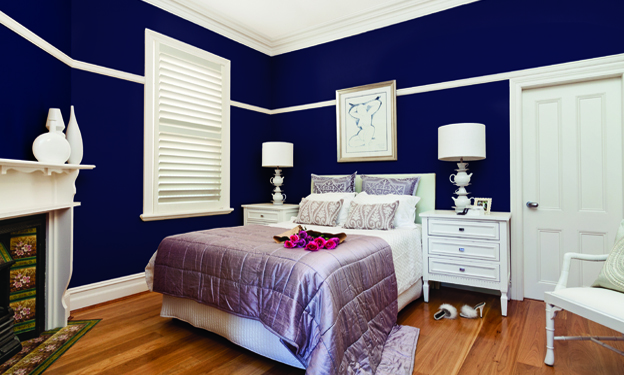 The strong tonal variation gives a timeless and classical feel to the space. It is often considered that to achieve a relaxed coastal style look you need to decorate with light, white and breezy colour schemes. 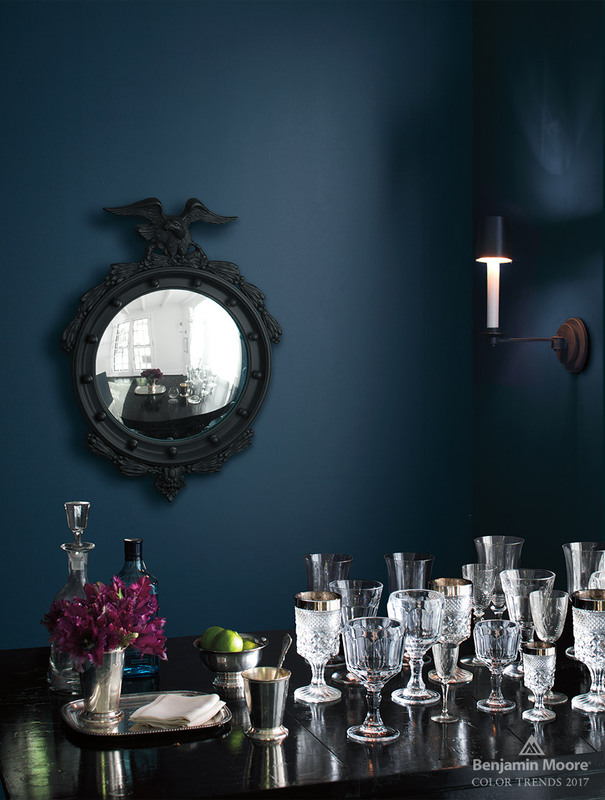 However this rich dark interior wall in a charcoal blue, which cleverly links to the exterior, brings a dramatic and moody touch without losing the coastal vibe. 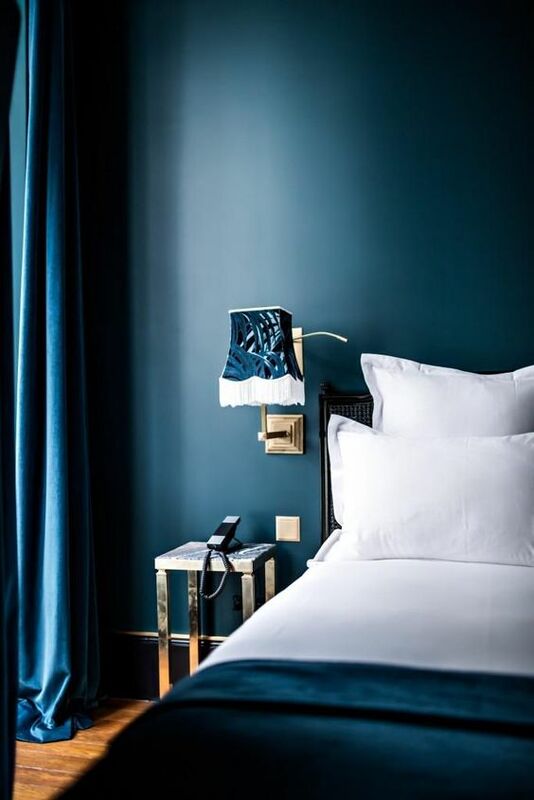 I also like to use a dark colour palette in a bedroom as I find them very restful and again they are a simple backdrop to fresher and lighter colours. I personally love these colour schemes and used a very dark grey in my living room when I decorated over ten years ago. I love it as it has created a beautiful serene environment and I would love to see more people using these gorgeous deep hues. Dark tones can either be offset with a lighter trim, usually an off-white, or you can use the same dark colour for your trim. It will depend upon the mood that you want to create so if you are looking for the richness of the darker colour, but want to offset it so that it isn’t too brooding, then an off white trim is the way to go. If you want dark and brooding, then omit the white trim. If you love the darker grey hues but find them too oppressive, then in addition to partnering with a white trim, you can also inject a splash of colour. 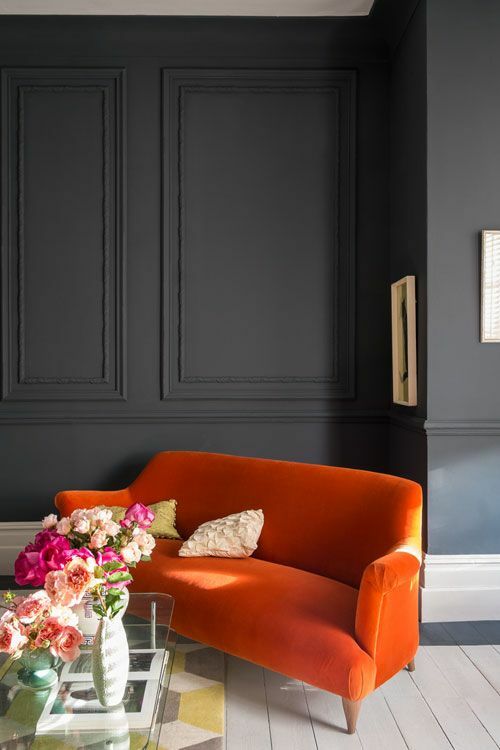 The orange sofa in the room above is the focal point and colour in the room and the grey wall is simply a dark neutral that recedes into the background. 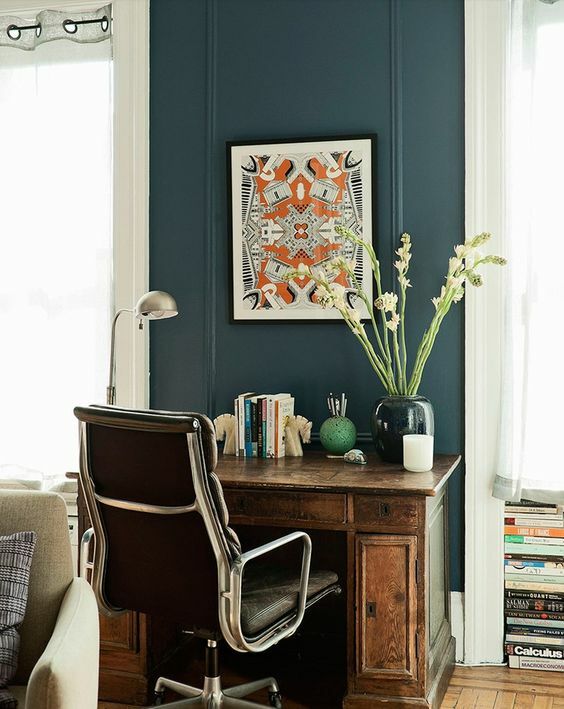 Dark tones used on just one wall can close the space in however when used on all four walls they appear to recede as you lose the definition of the corners. 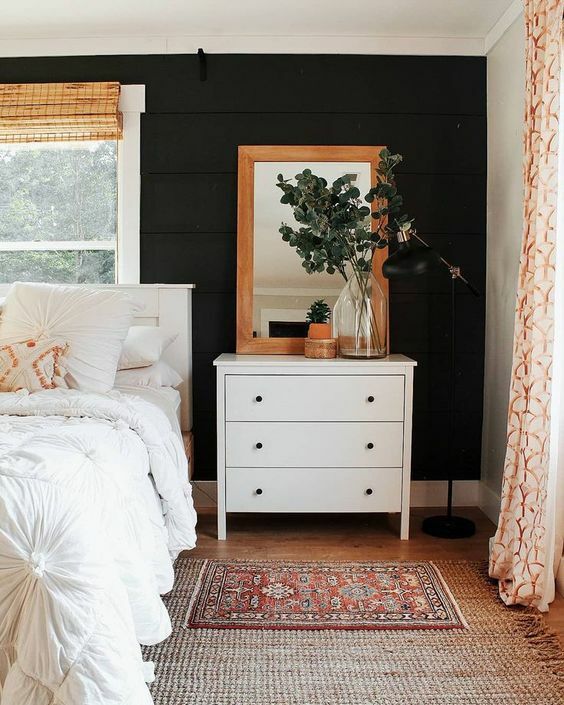 Rather than make the room appear very small, using dark colours like this will just make the room cosy and intimate. Dark tones are an excellent choice for dining rooms that are used predominantly at night time as rooms decorated like this come alive with the right lighting. Use a combination of wall lights, table lamps and some overhead lighting from feature pendants. A clever lighting plan to complement dark colours can work amazingly well. The introduction of mirrors too adds another dimension and helps to reflect light around the space. Strong dark colours can also be used to manipulate a space too. 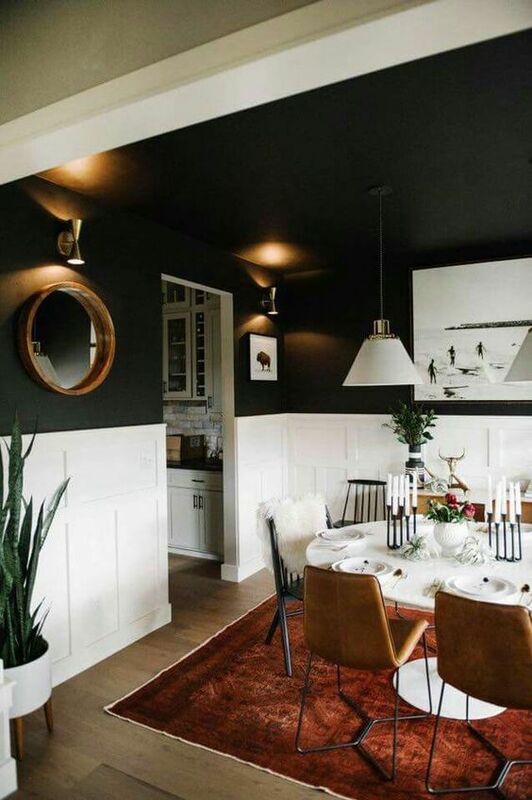 Using the off black on the walls and ceilings will lower the height of the room and make it feel more intimate without closing it in. This is a very clever use of colour and tone as you have a light and airy feel but the space seems intimate and cosy too. 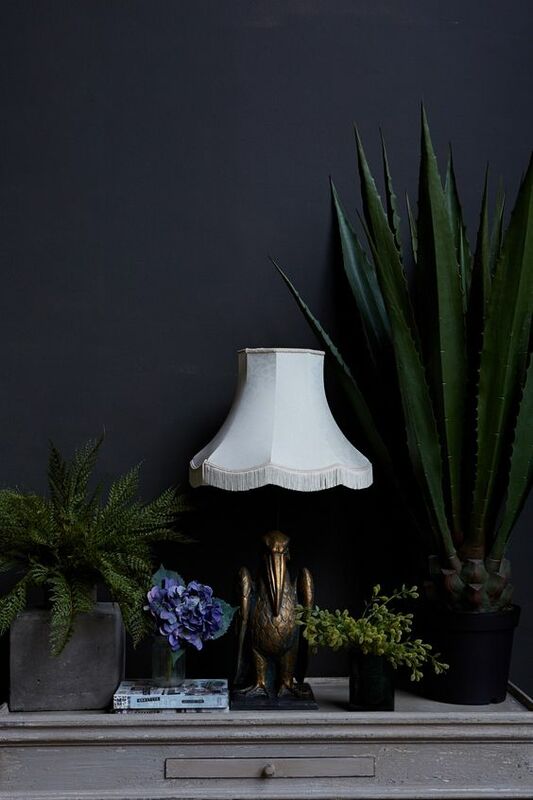 I hope this has inspired you to consider the use of dark colours – remember when decorating, it is often about the mood you want to create rather than the depth of colour. Consider this before you even start looking at paint charts. Let me know in the comments section below if you plan to use a scheme like this – I would love to hear how you go.